Well, we've spent our first night in the condo. The last days before the move were busy. I was exhausted, which is kind of a good thing since I fell asleep pretty much as soon as my head hit the pillow. I didn't have my usual first night in a new place anxieties. Well, I did feel them, but for about 2 minutes and then I was sleeping. I had taken the afternoon off to go work at the condo, instead I ended up taking my daughter, Cat, to the emergency clinic in the afternoon. She sprained her ankle at school. Dr. T to the rescue! He took me to the store so that I could go buy my bed frame and then we brought it over to the condo. When we got there, he installed the curtain rods and did most of the work to set up my new bed frame. I'm so very happy that he was there to lend a helping hand! He's good people that Dr. T! I decided to take the day off of work. I drove Cat to school because of her sprained ankle and then came back home to relax a little. 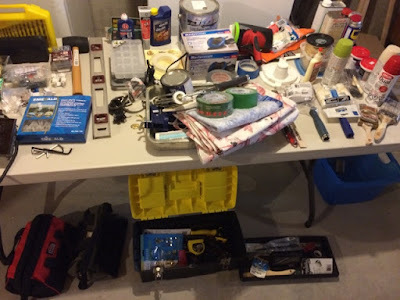 I then went over to the condo for a couple of hours to finish lining the kitchen cupboard shelves and unpacked the kitchenware from the bins I had brought over. I also hung curtains in the living room. We had a showing at the townhouse so we needed to be out of the house during the evening (I hate this part). Cat had an event to go to - it worked out for her. I took my mom to run some errands. Lots of errands. Then we went back to the condo for a little while before going to pick up Cat. (The event she went to was closer to the condo than to the house.) It gave me a chance to hang the clothes I brought over and bring back the empty bins to fill them back up at the townhouse. I brought over all of the remaining clothes that were hung in our closets and some of my daughter's boxes. The move went really well. The movers arrived 10 minutes before they were scheduled. They were fast, friendly, and professional. In the evening, the internet was installed. We went back to the house to pick up a few things (like curtains for my bedroom). What's planned for today? I have to go back to the townhouse for the inspection by the property manager. Ugh! Then a friend is supposed to pick up some of the furniture that I'm giving away. I have more stuff to bring over to the condo, and I have to clean the house. Not sure I'll be able to get all of that done today, but I'll sure try! I experienced a little inconvenience from my decluttering. To paint the ceilings, I needed a roller, an extension for the roller and a paint tray. I used to have all of that. But I got rid of them just a few weeks ago. So I had to borrow. I also needed screws and anchors for the curtain rod brackets. I used to have those too and got rid of them. Luckily, at the condo someone left a bag of random hardware which had what I needed. The lesson? You don't need to keep everything. If you don't have it, someone else might or you can go pick it up at the store. Sure, it's a little annoying that I didn't wait a few more days before getting rid of everything. But I managed. If I couldn't borrow the painting supplies, I saw that they weren't very expensive to replace when I went to buy the ceiling paint. Same goes for the screws and anchors. Even though I got rid of so much stuff, the move still felt stressful to me. I'm not exactly sure why. I feel like I definitely haven't gotten rid of enough stuff. I can get rid of more, and I will very soon. I thought I had everything under control. I thought I was well prepared. Nope! I'm better than in previous moves, but I still haven't figured out how to move well. I'm annoyed at myself. Things are so chaotic. One of the best motivations to get rid of your stuff - moving! It will officially be over on the 30th when I give back the keys to the townhouse. After that, it will just be Cat and I finally embarking on our new adventure as urbanites!